"My Polish friend's mother gave me this recipe years ago. She has been making this cheese forever in her house and also ate it while growing up in Poland. 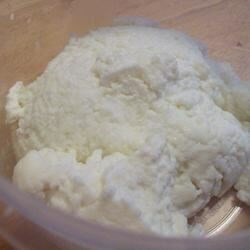 This is an easy home made farmer's cheese. It doesn't age well, so be sure you eat it within a week after it's made - well, if you can let it last that long. If you bake with it, it melts very beautifully. It makes a perfect soft cheese for snacking." When the milk begins to boil (small bubbles will first appear at the edges), turn off the heat. Stir lemon juice into the milk, and the milk will curdle. You may need to wait 5 or 10 minutes. Line a sieve or colander with a cheesecloth, and pour the milk through the cloth to catch the curds. What is left in the cheesecloth is the Farmer's Cheese. The liquid is the whey. Some people keep the whey and drink it, but I throw it away. Gather the cloth around the cheese, and squeeze out as much of the whey as you can. Wrap in plastic, or place in an airtight container. Store in the refrigerator. My Polish friend would also put hot pepper or black pepper into the milk before straining. This cheese is very flexible, so I'm thinking that you could put in jalapeno or other things that you like. Experiment, and leave a review of what you think.